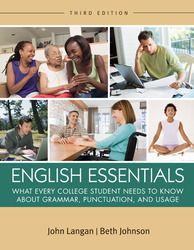 John Langan's English Essentials offers guidance through the grammar, punctuation, and usage skills needed for success in college and beyond. In short, English Essentials is an efficient, accessible, and helpful guide to mastering practical English skills. The book is divided into four parts -- Part One covers fifteen basic skills; Part Two offers more in-depth information about those and other skills; Part Three presents the essential skills of proofreading, and Part Four covers spelling improvement and dictionary use. This student-friendly organization and structure makes the book easy to navigate and a flexible guide.Each section provides essential instructions followed by ample activities to encourage learning in the best possible way: by doing. Relevance: New and revised examples, exercises, and tests based on the everyday issues and topics students encounter most. It's engaging and down to earth. Chapters in Part One are illustrated with photographs of real people, accompanied by stories about the roles that reading and writing play in their lives. Additional visuals appear in a new full-color insert with additional writing prompts. Personal photos and stories: The text illustrates grammar skills with photos and stories of interesting people from all walks of life. Engaging examples and materials: In addition to the photos and true-to-life stories, lively and engaging examples and practice materials help maintain student interest throughout. Inclusiveness: In addition to full coverage of grammar, punctuation, and usage skills, the texts includes a brief guide to writing, writing assignments, practice in the key skill of proofreading, and coverage of spelling, parts of speech, and dictionary use. Abundant opportunity for practice: Each chapter in Part One offers three full-page activities and five full-page tests. The last two of the tests are designed to resemble standardized tests and permit easy grading. Now with Connect Writing: Sentence Skills now comes with innovative Connect Writing software, providing additional guided practice for college writers. We know that students have varying preferences and needs with regards to their textbook choices and learning styles. Connect Writing allows students to become successful college writers while learning the way they want to learn—online. Through the use of diagnostic drills the program will pinpoint areas of improvement for each student in your class, then use interesting animations and real-world examples to motivate students to practice. When students can focus on their weaknesses outside of the classroom, you will save valuable time in the classroom. Connect Writing Contact your local sales rep for a registration code. It's easy to use. The book is divided into four parts. Part One focuses on fifteen basic skills, and Part Two offers more in-depth information about these and other skills. Part Three presents the essential skills of proofreading, while Part Four covers spelling improvement and dictionary use. It provides plenty of practice. Each section provides essential instruction followed by ample activities. The second edition also has more writing prompts than ever, for further practice. Superior Supplements: The following supplements are available at no charge to instructors adopting the book: (1) An Instructor’s Edition that is identical to the student text, (2) A combined Instructor’s Manual and Test Bank, and (3) A Student Answer Key.